Home Movies Blu-ray Middle-Earth 6-Film Collection Arrives in November! Middle-Earth 6-Film Collection Arrives in November! This is what Middle-Earth fans have been waiting for! Finally, we have a complete collection of all of Peter Jackson’s seminal films. Check out the opening of the box set, pictures, and full details below! Own the Middle-Earth 6-Film Collection on November 1! Press Release: Burbank, Calif., August 19, 2016 – Fans of Middle-earth will have the opportunity to re-live the entire collection of The Hobbit andThe Lord of the Rings films, from Academy Award®-winning filmmaker Peter Jackson1, when the two epic trilogies are released as a single collection on Blu-ray™ and DVD on November 1st from Warner Bros. Home Entertainment (WBHE). From New Line Cinema, Metro-Goldwyn-Mayer Pictures, and WBHE this new collection will be offered in two different versions: The Limited Collector’s Edition and The Theatrical Versions Collection. 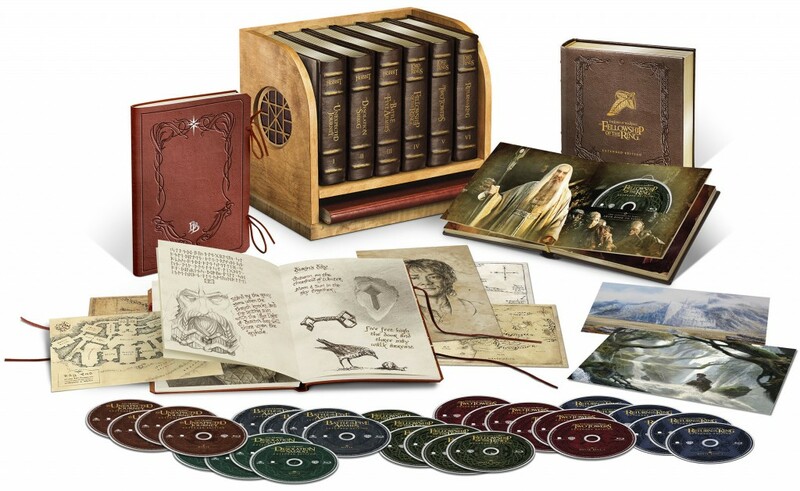 The Limited Collector’s Edition includes 30 discs featuring The Hobbit: An Unexpected Journey, The Hobbit: The Desolation of Smaug, The Hobbit: The Battle of the Five Armies, The Lord of the Rings: The Fellowship of the Ring, The Lord of the Rings: The Two Towers, and The Lord of the Rings: The Return of the King, in their extended edition forms housed in six faux leather books and a collectible Hobbit-style wood shelf. In addition, all previously released bonus content from both the theatrical and extended edition releases will be included in the collection. Also included in the collection are premium collectibles including an exclusive 100-page sketch-style book with replica The Red Book of Westmarch, and two original reproductions of watercolor paintings by acclaimed conceptual artists Alan Lee and John Howe. The Theatrical Versions collection features The Hobbit: An Unexpected Journey, The Hobbit: The Desolation of Smaug, The Hobbit: The Battle of the Five Armies, The Lord of the Rings: The Fellowship of the Ring, The Lord of the Rings: The Two Towers, and The Lord of the Rings: The Return of the King, in their theatrical forms as a 6-disc Blu-ray™ or DVD set. 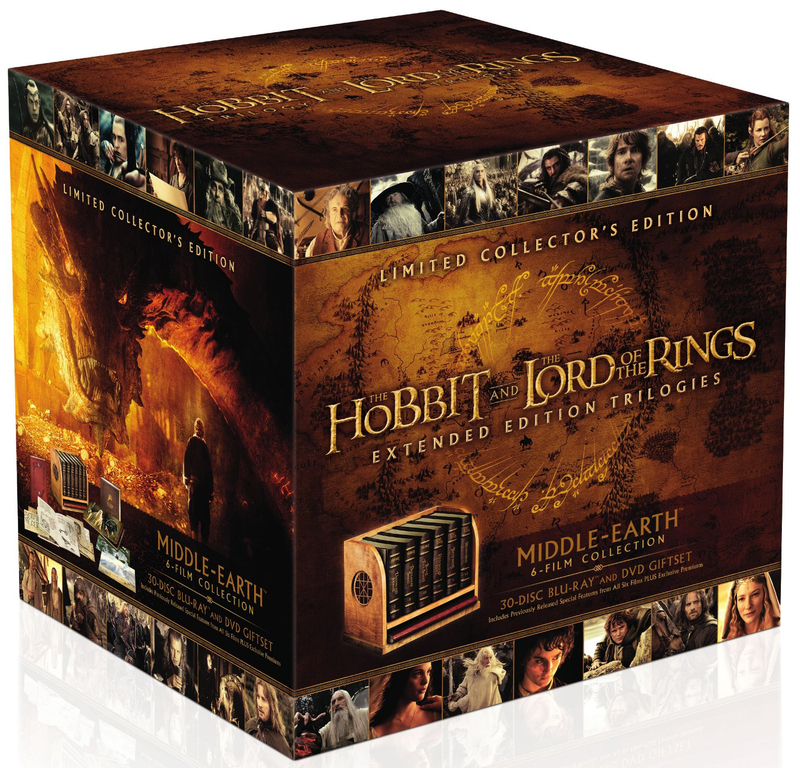 The Middle-earth 6-Film Limited Collector’s Edition will be available on November 1 as a 30-disc set for $799.99 SRP . The Limited Collector’s Edition includes all six films on Blu-ray™ disc in their extended edition forms. 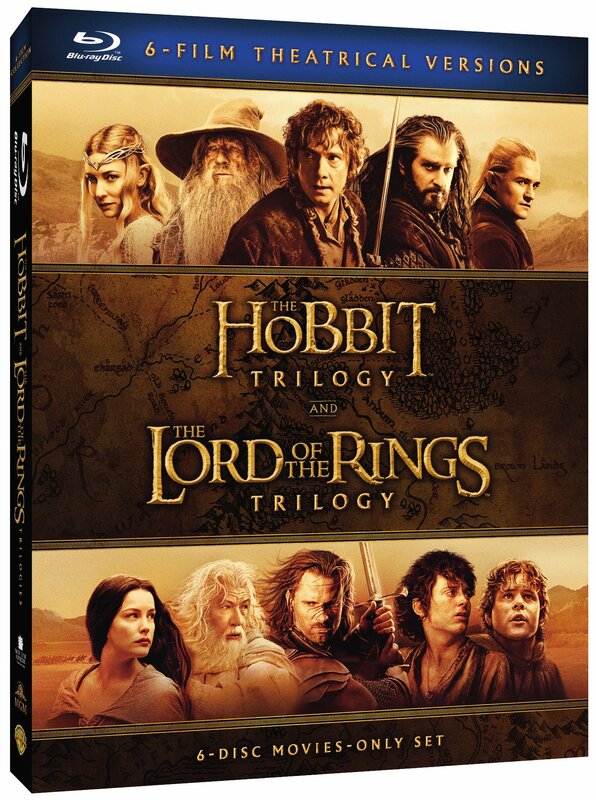 Bonus content from The Hobbit trilogy theatrical and extended editions will be included on Blu-ray disc. Bonus content from The Lord of the Rings trilogy theatrical and extended editions will be included on DVD disc. The Lord of the Rings Extended Edition Trilogy features more than 2 hours of extended scenes that were carefully selected under the supervision of director Peter Jackson, and more than 33 hours of theatrical and extended bonus content. The Hobbit Extended Edition Trilogy features almost one hour of additional footage, also selected by Jackson (The Hobbit: Battle of the Five Armies extended edition is rated R), and more than 34 hours of theatrical and extended bonus content. Additionally, digital copies of all films in their theatrical and extended edition forms will be included for download on Digital HD. The Middle-earth 6-Film Collection Theatrical Versions will be available on November 1 as a 6-disc Blu-ray™ set for $68.99 SRP and DVD for $35.99 SRP. Fans can also own the Middle-earth 6-Film Collection Theatrical Versions via purchase from digital retailers. The Hobbit: An Unexpected Journey is the first in Peter Jackson’s highly anticipated trilogy adapting the enduringly popular masterpiece The Hobbit, by J.R.R. Tolkien. The adventure follows the journey of title character Bilbo Baggins, who is swept into an epic quest to reclaim the lost Dwarf Kingdom of Erebor from the fearsome Dragon Smaug. Approached out of the blue by the Wizard Gandalf the Grey, Bilbo finds himself joining a company of 13 Dwarves led by the legendary warrior, Thorin Oakenshield. Their journey will take them into the Wild, through treacherous lands swarming with Goblins, Orcs and deadly Wargs, as well as a mysterious and sinister figure known only as the Necromancer. Although their goal lies to the East and the wastelands of the Lonely Mountain, first they must escape the Goblin tunnels, where Bilbo meets the creature that will change his life forever…Gollum. Here, alone with Gollum, on the shores of an underground lake, the unassuming Bilbo Baggins not only discovers depths of ingenuity and courage that surprise even him; he also gains possession of Gollum’s “precious” ring that holds unexpected and useful qualities…A simple, gold ring that is tied to the fate of all Middle-earth in ways Bilbo cannot begin to know. Ian McKellen returns as Gandalf the Grey, the character he played in The Lord of the Rings Trilogy, with Martin Freeman in the central role of Bilbo Baggins, and Richard Armitage as Thorin Oakenshield. Also reprising their roles from “The Lord of the Rings” in “The Hobbit” Trilogy are: Cate Blanchett as Galadriel; Ian Holm as Old Bilbo; Christopher Lee as Saruman; Hugo Weaving as Elrond; Elijah Wood as Frodo; and Andy Serkis as Gollum. The international ensemble cast also includes James Nesbitt, Ken Stott, Sylvester McCoy, Barry Humphries, Aidan Turner, Dean O’Gorman, Graham McTavish, Adam Brown, Peter Hambleton, John Callen, Mark Hadlow, Jed Brophy, William Kircher, Stephen Hunter, Lee Pace, Benedict Cumberbatch, Manu Bennett and Conan Stevens. The screenplay for The Hobbit: An Unexpected Journey is by Fran Walsh & Philippa Boyens & Peter Jackson & Guillermo del Toro, based on the novel by J.R.R. Tolkien. 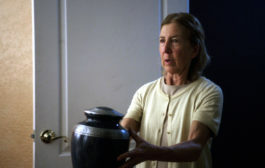 Jackson also produced the film, together with Carolynne Cunningham, Zane Weiner and Fran Walsh. The executive producers are Alan Horn, Toby Emmerich, Ken Kamins and Carolyn Blackwood, with Boyens and Eileen Moran serving as co-producers. New Line Cinema and Metro-Goldwyn-Mayer Pictures (MGM), Present a WingNut Films Production, The Hobbit: An Unexpected Journey. All three films in The Hobbit Trilogy, also including The Hobbit: The Desolation of Smaug, and the final film, The Hobbit: The Battle of the Five Armies, are productions of New Line Cinema and Metro-Goldwyn-Mayer Pictures (MGM), with New Line managing production. Warner Bros. Pictures handled worldwide theatrical distribution, with select international territories as well as all international television distribution handled by MGM. The Hobbit: The Desolation of Smaug continues the adventure of the title character Bilbo Baggins as he journeys with the Wizard Gandalf and thirteen Dwarves, led by Thorin Oakenshield, on an epic quest to reclaim the Lonely Mountain and the lost Dwarf Kingdom of Erebor. Having survived the beginning of their unexpected journey, the Company travels East, encountering along the way skin-changer Beorn and a swarm of giant Spiders in the treacherous forest of Mirkwood. After escaping capture by the dangerous Wood-elves, the Dwarves journey to Lake-town, and finally to the Lonely Mountain itself, where they must face the greatest danger of all–a creature more terrifying than any other; one which will test not only the depth of their courage but the limits of their friendship and the wisdom of the journey itself–The Dragon Smaug. From Academy Award®-winning filmmaker, Peter Jackson1, the screenplay for The Hobbit: The Desolation of Smaug is by Fran Walsh & Philippa Boyens & Peter Jackson & Guillermo del Toro, based on the novel by J.R.R. Tolkien. Jackson also produced the film, together with Carolynne Cunningham, Zane Weiner and Fran Walsh. The executive producers are Alan Horn, Toby Emmerich, Ken Kamins and Carolyn Blackwood, with Philippa Boyens and Eileen Moran serving as co-producers. New Line Cinema and Metro-Goldwyn-Mayer Pictures Present a Wingnut Films Production, The Hobbit: The Desolation of Smaug. The film is a production of New Line Cinema and Metro-Goldwyn-Mayer Pictures (MGM), with New Line managing production. Warner Bros. Pictures handled worldwide theatrical distribution, with select international territories as well as all international television distribution being handled by MGM. “The Hobbit: The Battle of the Five Armies” brings to an epic conclusion the adventure of Bilbo Baggins (Martin Freeman), Thorin Oakenshield (Richard Armitage) and the Company of Dwarves. The Dwarves of Erebor have reclaimed the vast wealth of their homeland, but now must face the consequences of having unleashed the terrifying Dragon, Smaug, upon the defenseless men, women and children of Lake-town. As he succumbs to dragon-sickness, the King Under the Mountain, Thorin Oakenshield, sacrifices friendship and honor in search for the legendary Arkenstone. Unable to help Thorin see reason, Bilbo is driven to make a desperate and dangerous choice, not knowing that even greater perils lie ahead. An ancient enemy has returned to Middle-earth. Sauron, the Dark Lord, has sent forth legions of Orcs in a stealth attack upon the Lonely Mountain. 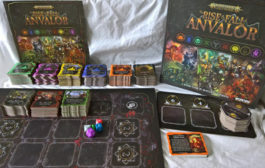 As darkness converges on their escalating conflict, the races of Dwarves, Elves and Men must decide – unite or be destroyed. Bilbo finds himself fighting for his life and the lives of his friends as five great armies go to war. Ian McKellen returns as Gandalf the Grey, with Martin Freeman in the central role of Bilbo Baggins, and Richard Armitage as Thorin Oakenshield. The international ensemble cast is led by Evangeline Lilly, Luke Evans, Lee Pace, Benedict Cumberbatch, Billy Connolly, James Nesbitt, Ken Stott, Aidan Turner, Dean O’Gorman, Graham McTavish, Stephen Fry and Ryan Cage. The film also stars Cate Blanchett, Ian Holm, Christopher Lee, Hugo Weaving, Orlando Bloom, Mikael Persbrandt, Sylvester McCoy, Peter Hambleton, John Callen, Mark Hadlow, Jed Brophy, William Kircher, Stephen Hunter, Adam Brown, John Bell, Manu Bennett and John Tui. From Academy Award®-winning filmmaker Peter Jackson1 comes “The Hobbit: The Battle of the Five Armies,” from a screenplay by Fran Walsh & Philippa Boyens & Peter Jackson & Guillermo del Toro, based on the novel by J.R.R. Tolkien. Jackson also produced the film, together with Carolynne Cunningham, Zane Weiner and Fran Walsh. The executive producers are Alan Horn, Toby Emmerich, Ken Kamins and Carolyn Blackwood, with Philippa Boyens and Eileen Moran serving as co-producers. The creative behind-the-scenes team is led by director of photography, the late Andrew Lesnie, production designer Dan Hennah, editor Jabez Olssen and composer Howard Shore. The costumes are designed by Richard Taylor, Bob Buck and Ann Maskrey. 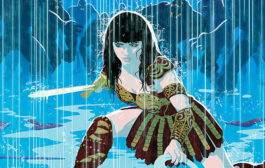 Taylor is also overseeing the design and production of armour, weapons, creatures and special makeup, which are once again being made by the award-winning Weta Workshop. Oscar-winning visual effects studio Weta Digital2 is again handling the visual effects for the film, led by senior visual effects supervisor Joe Letteri. The hair and makeup designer is Peter Swords King. The conceptual designers are John Howe and Alan Lee. Eric Saindon is the visual effects supervisor, with David Clayton serving as animation supervisor. New Line Cinema and Metro-Goldwyn-Mayer Pictures Present a Wingnut Films Production, “The Hobbit: The Battle of the Five Armies.” The film is a production of New Line Cinema and Metro-Goldwyn-Mayer Pictures (MGM), with New Line managing production. 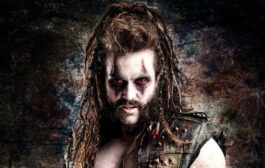 Warner Bros. Pictures is handling worldwide theatrical distribution, with select international territories as well as all international television distribution being handled by MGM. In this first part of The Lord of the Rings film trilogy, the young hobbit Frodo Baggins inherits a ring; but this ring is no mere trinket. It is the One Ring, an instrument of absolute power that could allow Sauron, the dark Lord of Mordor, to rule Middle-earth and enslave its peoples. Frodo, together with a Fellowship that includes his loyal hobbit friends, humans, a wizard, a dwarf and an elf, must take the One Ring across Middle-earth to Mount Doom, where it first was forged, and destroy it forever. Such a journey means venturing deep into territory manned by Sauron, where he is amassing his army of Orcs. And it is not only external evils that the Fellowship must combat, but also internal dissension and the corrupting influence of the One Ring itself. The course of future history is entwined with the fate of the Fellowship. The film won four Oscars® in 2001 for Best Visual Effects, Cinematography, Makeup and Original Score. The film stars Elijah Wood, Ian McKellen, Liv Tyler, Viggo Mortensen, Sean Astin, Cate Blanchett, John Rhys-Davies, Billy Boyd, Dominic Monaghan, Orlando Bloom, Christopher Lee, Hugo Weaving, featuring Sean Bean and Ian Holm, with Andy Serkis as Gollum. The film also stars Marton Csokas, Craig Parker and Lawrence Makaoare. In their parallel journeys, the Fellowship will stand against the powerful forces spreading from the Two Towers — Orthanc Tower in Isengard, where Saruman has bred a lethal army of 10,000 strong; and Sauron’s fortress at Barad-dûr, deep within the dark lands of Mordor. The Lord of the Rings: The Two Towers culminates in the astonishing battle for the refuge, Helm’s Deep, the Kingdom of Rohan’s ancient large stone fortress, besieged by Uruk-hai warriors. The film won two Oscars in 2002: Best Sound Editing and Best Visual Effects. The final battle for Middle-earth begins. Frodo and Sam (Sean Astin), led by the mysterious Gollum (Andy Serkis), continue their dangerous mission toward the fires of Mount Doom in order to destroy the One Ring. Aragorn (Viggo Mortensen) struggles to fulfill his legacy as he leads his outnumbered followers against the growing power of the Dark Lord Sauron, so that the Ring-bearer may complete his quest. The film, which won Academy Awards® in all 11 categories for which it was nominated in 2003, took wins for Best Picture, Director, Editing, Art Direction, Costume Design, Visual Effects, Makeup, Adapted Screenplay, Sound Mixing, Original Song and Original Score.